So we've finished day two of workshops for Alice in infiniteland, an Eero-Tapio Vuori directed piece with Teatteri Naamio ja Höyhen, coming up one year from now. At the moment, there are five bathroom-mirror-sized mirrors dangling from the theatre ceiling, complementing our other collection of reflective surfaces around the lobby, toilets, and dressing rooms at the theatre. We've been, for the last two sessions, experimenting with the idea of performing in a mirror. To a mirror. Performing as though nobody else is there, and then performing exactly the same thing (or similar) to an audience. You know how you're at home brushing your teeth and all of a sudden your eyebrows become interesting and fifteen minutes later you've done an eyebrow opera to nobody but yourself? That's related to this kind of thing. When these cats did Beyond the Red Room (I just took over lights at some point) I thought it looked easy, what they were doing. It was simply a matter of presence. You switch it on, there it is. After watching it again and again I rather lost a sense of how delicate it was. Yesterday for me trying to be fully in the here and now felt like squeezing a lemon through the eye of a needle. My voice went fake, I censored myself, etc etc. Today I had a much nicer session. This probably sounds all wonky to someone who hasn't tried it or seen it, but if you've tried meditation, you'll have an idea of what it's like. It's vaguely like performing in a meditative state; it's far more active than just sitting and breathing, though. It's more the performative embodiment of the principle of Only This Moment Exists. And as with meditation, there's a profound freedom when you slip into the moment of now. 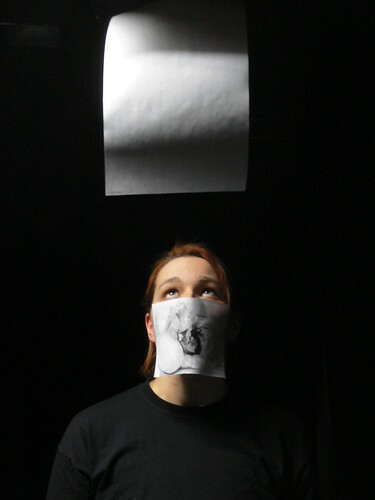 In a way, other training styles like the Lecoq neutral mask also develop a similar faculty in the actor. For now in this project, it's more about gurning in a mirror and really meaning it. If that makes any sense. These are beginning experiments in transformations--where does a character begin, and where does it end? When do I say I am me, and when am I the character? If ever? Where is the limit, or if there isn't one, what does that say about acting? I don't really want to ruin the surprise of the process, but I also rather like recording it; we did some work getting into a character with full costume and makeup, and then getting back out into "normality", and then repeating the process with an audience. It's all terribly easy or ridiculously hard depending on how you look at it, but it at least is interesting to watch. With themes like parallel universes, the psychology of an actor, Alice in Wonderland, and sexual perversity, how can you go wrong, really? Or do I need to get out of this place?